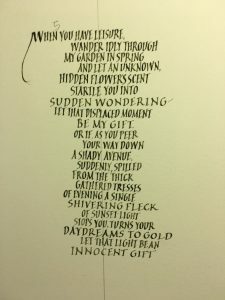 How fortunate we are as calligraphers not only to be moved by the words of authors and poets, but also to be able to interpret that text visually. 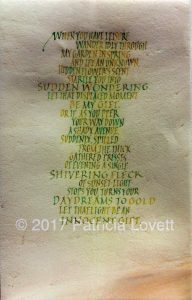 I had the task of creating a number of pieces of the same artwork for a special occasion – what to choose, and how to interpret the text? As it’s what I do, I homed in on vellum and quills, and had some lovely classic-finish skin which hadn’t been bleached too much so still had many of the characteristics of the animal such as darker areas, veining and specks of hair follicles. 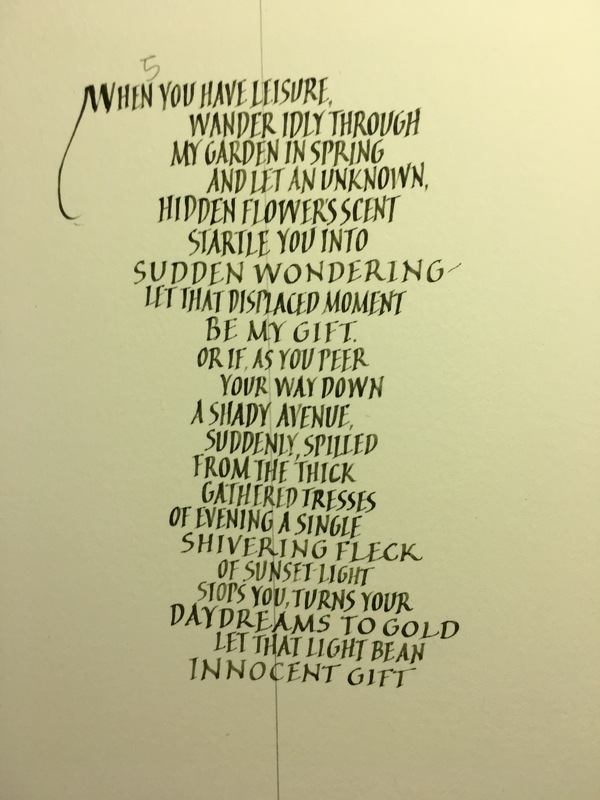 I wanted something that would be a bit of challenge as I had to write it out over a dozen times and I do tend to get bored rather easily (! ), but I hadn’t quite appreciated the extent of that challenge when I started! 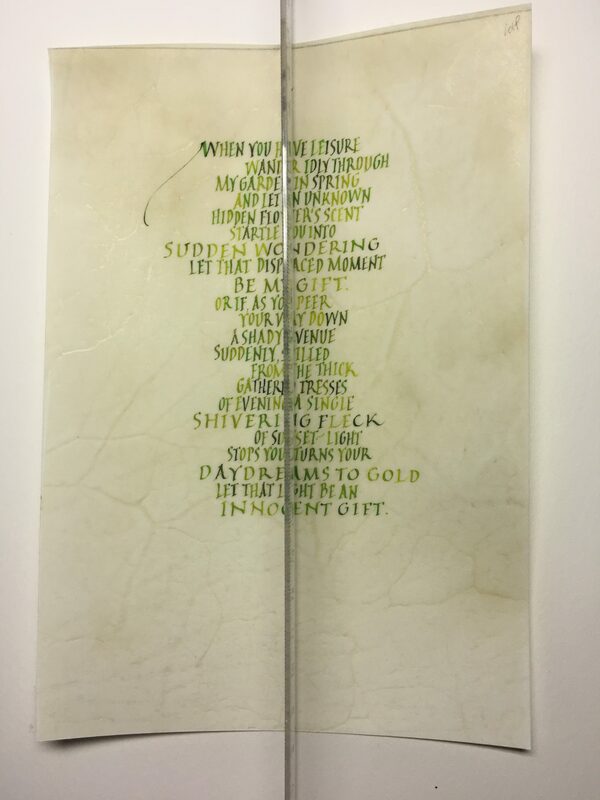 As it was a special occasion I chose my favourite verse of my favourite poem, Gift, by the Bengali poet Rabindranath Tagore. 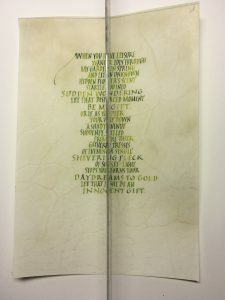 In this poem he writes about what he could give to show that he cares. Tagore considers a flower – it will fade, a jewel – it could get lost, a candle in the darkness – it will get blown out. 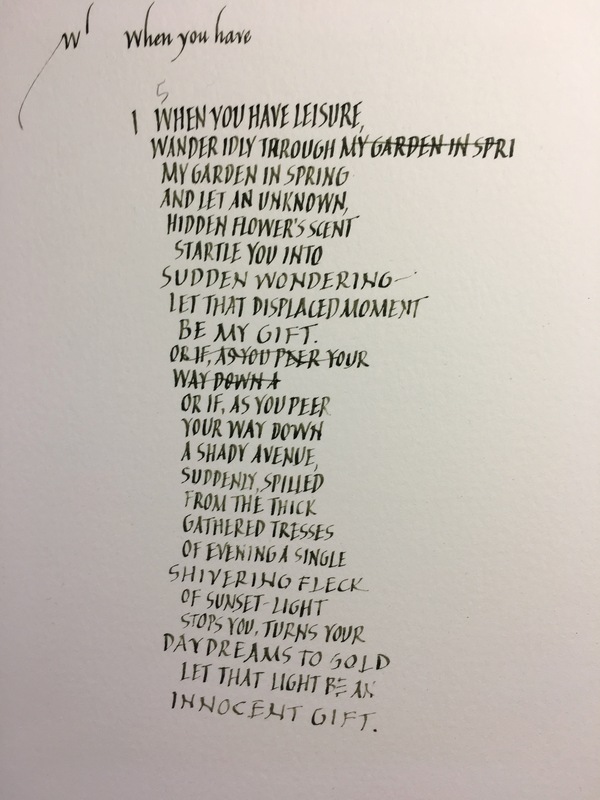 So he chooses a moment – that point when, wandering in a garden, a hidden flower’s scent ‘startles you into sudden wondering’. Or when, at dusk, a ‘single shivering fleck of sunset-light turns your daydreams to gold’ (I get a shiver up the spine whenever I read that). 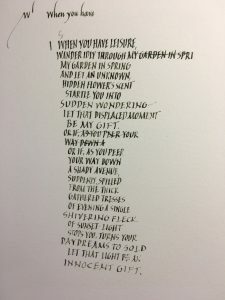 I tried the verse in various formats, portrait, landscape, in Italic, in Foundational hand, and in the end decided to go for Compressed Italic Majuscles (Capitals) with the words and phrases that meant to most to me in wider Roman Capitals. 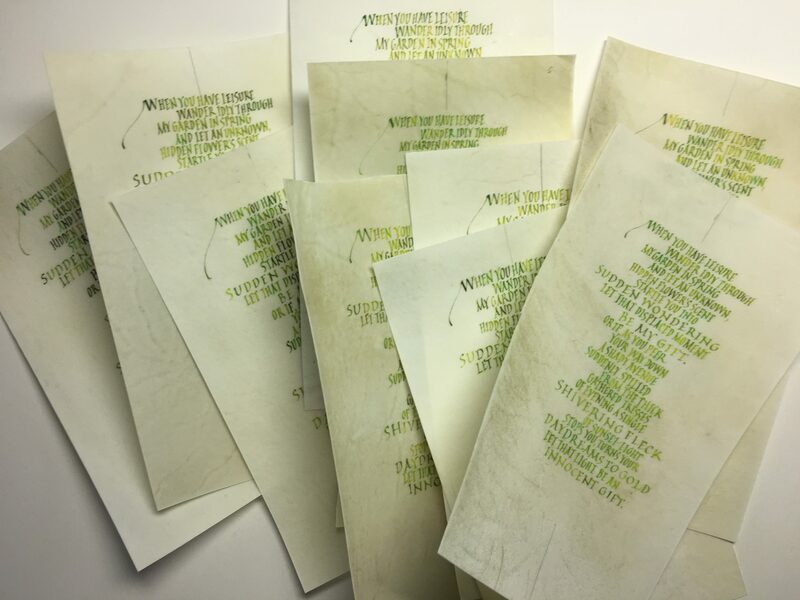 Rather than using the same colour, I chose three – bright yellow, a bright green and an olive green as I felt these reflected the colours in the verse, and fed these into the pen as I wrote. This is technically quite challenging to do as you can see here and here. 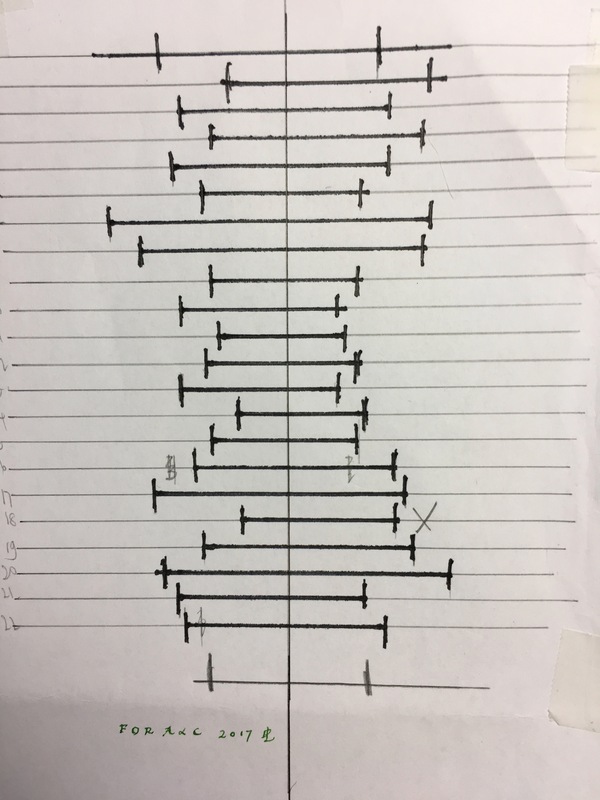 So the first thing to do was to see how the lines would fall, as on the right above. Having determined the line endings and seen how big the piece was, I realised that I needed to go down a nib size, as on the right, but even this was too big, so I then went for the smallest nib size – a size 6 – this was turning into quite a challenge! I did have the basic layout of the poem though. I don’t usually use lines for these pieces, relying on eye and the balance of the text, but to do this number, I appreciated that I did need some sort of guide. The great thing about vellum is that usually you can just about see through it. So I worked out the line spacing, length of lines, beginnings and endings and the balance of the artwork and ruled up a piece of paper to use as my guide on which I placed the prepared cut pieces of vellum ready to write. Pieces that are completely evenly centred often cause a problem as the eye is taken by the shape the edges of the lines make, so in my view it’s better to have the lines based on a central line. For this, to ensure that there is a balance, use a plastic ruler and place the narrow edge down the vertical central line of the piece. Half close your eyes and there should be the same amount of text on the right-hand side of the line as there is on the left. It can take some adjusting of individual lines to achieve this. 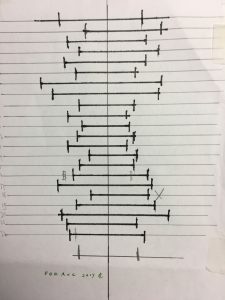 What is important is that some part of all the lines must go through this central line; if they are flying off to the right or left without this the piece has no cohesion, no spine. So I was ready to go, and hope that the recipients are pleased with their original artworks, each one different. 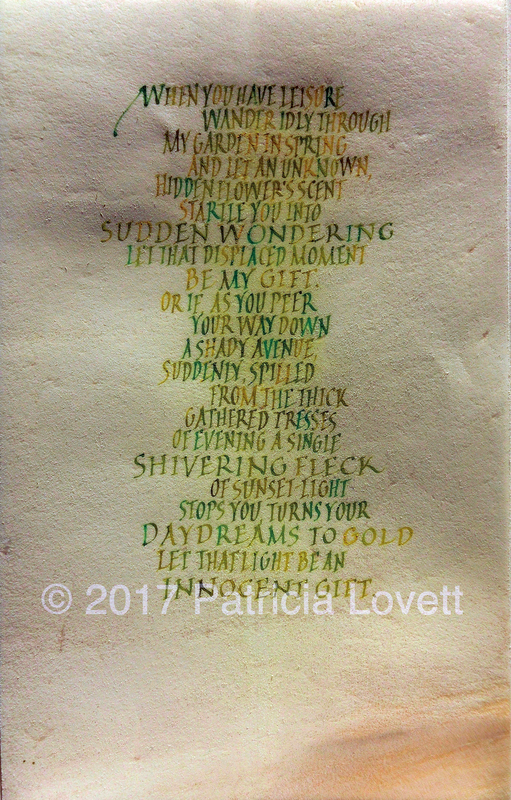 This entry was posted in Blog, Calligraphy and lettering, Calligraphy techniques and tagged calligraphy, Gift, Gift by Rabindranath Tagore, Rabindranath Tagore on 15 March 2017 by Patricia.